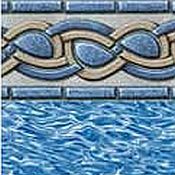 Marigo Bay Vinyl Beaded 20 Gauge Pool Liner for Above Ground Swimming Pools. Our premium liners are protected from pool chemicals and the sun's damaging U.V. rays. Our liners will last longer and maintain their beautiful appearance for years. THIS PATTERN HAS BEEN DISCONTINUED.